Lomba Bahasa Inggris UNESHCO 2018 Univ. Negeri Yogyakarta | Mahasiswa | Deadline 30 Maret 2018 | Lomba.co - Kesempatan kali ini kembali admin bagikan lomba terbaru buat kalian-kalian semua. Nah karena kali ini mengusung lomba bahasa inggris, yuk bagi kalian semua para mahasiswa yang ingin mengikuti lomba langsung saja daftarkan diri anda karena waktu pendaftaran di akhir bulan maret ini lho. Selengkapnya bisa kalian lihat informasi lengkapnya dibawah ini ya. 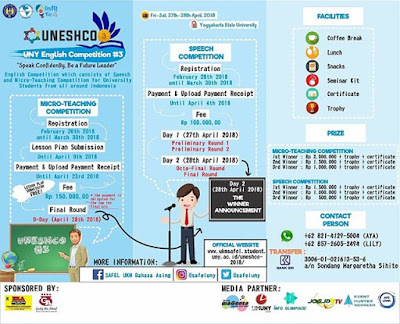 UNESHCO (UNY English Competition) is a National English competition for university students held annually by UKM SAFEL (Student Activity Forum of Foreign Languages), Yogyakarta State University (UNY). This competition is one of the agendas in commemorating Dies Natalis UNY which consists of Speech and Micro-teaching competitions. This event has been organized twice since 2016 and the third is going to be held on 27th – 28th April, 2018 in UNY. This year UNESHCO brings the theme “Speak confidently, be the future leader”. By this theme, it is expected that the participants will speak more confident as one of their requirements to be the future leader. UNESHCO itself is aimed to increase confidence, creativity, and critical thinking of the participants to face the current and future problems. 1. The participants are university students (S1) in Indonesia. 2. The participants must be 18-25 years old. 3. Each university is allowed to send maximum of five delegates. 4. The participants who have won UNESHCO in 2016 and 2017 are not allowed to register themselves in UNESHCO 2018. 5. The participants should dress appropriately. 6. The participants must attend the Opening Ceremony of UNESHCO and UNYFEST on Friday, 27th April, 2018. 7. The Participant must attend the Closing Ceremony UNYFEST and The Winner Announcement on Saturday, 28th April, 2018. 8. The participants are highly suggested to come at least 30 minutes before the Opening Ceremony and must re-register themselves at the registration desk before the Opening Ceremony starts. 9. All the participants must arrive at the hall room at least 15 minutes before the competition starts. 10. All the participants will be called 3 times when their turn comes before they are considered as walk-out. 11. Any properties categorized as sharp tools, dangerous weapons, chemicals and animals are prohibited during the competition. 12. The committee only provides LCD projector, screen, and electricity. Additional teaching aids are participants’ responsibility as well as for speech. 13. The participants are suggested to bring their own stationery to support the necessary things. 14. For micro-teaching competition, additional teaching materials such as PowerPoint, video, etc. can be sent to the committee two days before the Please email the materials to ukmsafel@student.uny.ac.id by using format Name_Institute_MT_(additional materials). 15. This competition will be held in Yogyakarta State University (UNY). Therefore, any accommodation expenses are not the committee’s responsibility. 16. All judges decisions and results inside the result assessment are considered as final. PRIZES and FACILITIES are provided. Belum ada Komentar untuk "Lomba Bahasa Inggris UNESHCO 2018 UNY"